Bath Coffee is the ultimate green beauty brew at SpaFetish! Most assuredly, in an era when Bath Bubbles, Bath Tea and Bath Milk get far more play than a Coffee Bath, we thought it high time to rethink the ingredients of a good Bath Soak! Thus, we were ever pleased to find that freshly ground Fair Trade Coffee, cold-pressed herbs, and a good balance of vitamins can add up to pure bathing enjoyment. Sure, a cup of freshly brewed coffee is a welcome start to any day. But, we have learned that the only thing equal is the beauty benefits of soaking in it. In fact, recent studies have suggested that coffee is a praiseworthy body treatment that stimulates the meridians and nervous system in the body, to discharge deep-rooted tension, thereby promoting energy flow and restoring balance, in addition to overall well being. Thus said, herewith, we are delighted to play barista, as we serve up a fresh batch of Bath Coffee. Enjoy! Our Bath Coffee befits a uniquely delicious spa soak! Here, we serve it black, bold and completely unadorned. 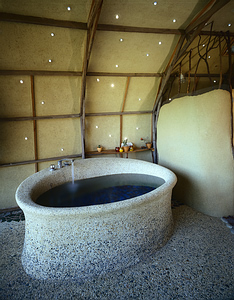 This is the ideal Coffee Bath, for those who love their java plain – with nothing else to spoil the perfection! Our Bath Coffee is presented in a one pound (16 oz.) recyclable jar. A gratis 9 oz. Coffee Lotion is included. Here, we paired our Bath Coffee with Fair Trade Cocoa, Dark Chocolate and a hint of Peppermint -- for a spa soak that is nothing less than pure perfection! Our Bath Coffee is presented in a one pound (16 oz.) recyclable jar. A gratis 9 oz. Coffee Lotion is included. As if our Bath Coffee were not perfect enough as a stand alone, here it is redolent with Hazelnut. 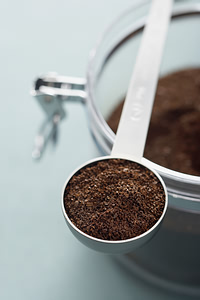 The natural essence of Hazelnut releases an earthy scent into your Hazelnut Bath Coffee that compliments it well. Our Bath Coffee is presented in a one pound (16 oz.) recyclable jar. A gratis 9 oz. Coffee Lotion is included. Here, we've taken our Bath Coffee to new heights of deliciousness – by pairing it with rich Chocolate in this Mocha Coffee Bath. The divine result is pure decadence! Our Bath Coffee is presented in a one pound (16 oz.) recyclable jar. A gratis 9 oz. Coffee Lotion is included. Here, our Bath Coffee gets a refreshing update with the infusion of locally harvested Peppermint leaves that are delicately crushed to release their natural essence. A pinch of Wintergreen pairs beautifully with our Peppermint Bath Coffee to steady the body, mind and spirit. Our Bath Coffee is presented in a one pound (16 oz.) recyclable jar. A gratis 9 oz. Coffee Lotion is included.